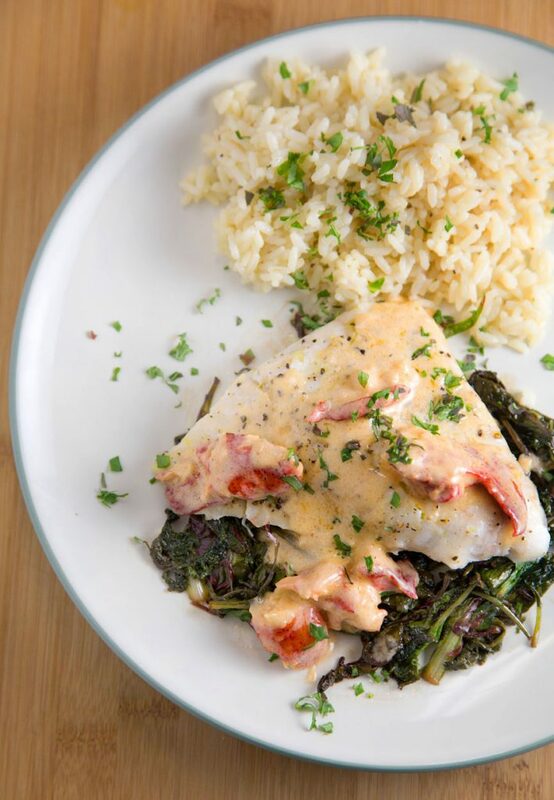 This lobster cream sauce turns this red snapper into perfection on a plate. 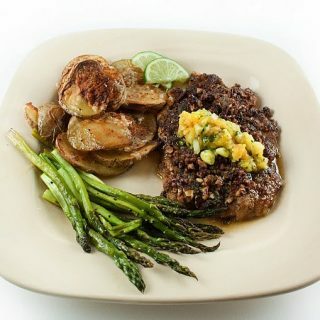 When you can make restaurant style dishes this delicious in your own home, why go out? 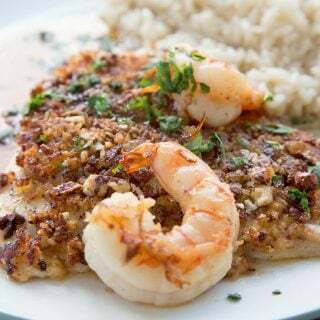 My Red Snapper with a Lobster Cream Sauce is the perfect restaurant style dish to make when you hear company’s coming over or a delicious date night dinner with your significant other. 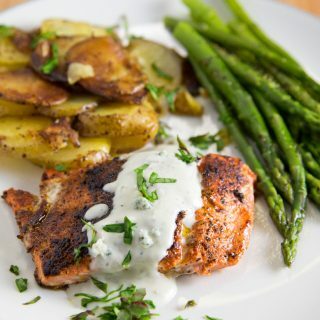 It’s not as hard as you might think to make this delicious Restaurant Style Dish. And for most Restaurant Style Dishes, it’s all about finding the right ingredients and these days you can find most of them in your local supermarket. I am careful about sourcing seafood and like to know where the products I’m serving come from, so make sure to read the label to find the country of origin of the products you’re purchasing. I’ve been enjoying shopping at Costco’s more these days because they’ve added so many Organic and healthy products to their line as well as some well-sourced frozen seafood. And that makes my job easier and dinner even more affordable. I’ve found well sourced Mahi-Mahi, Coho Salmon and Red Snapper at my Costco and hopefully, they’ll continue to add to their well-sourced product line. You might ask what isn’t well sourced? My list of undesirable products is Atlantic Salmon, Farmed seafood of any type (except for clams and mussels) and Seafood out of Asian or Indian waters that I can’t personally verify as safe. I’m not saying these aren’t good products, but I won’t risk it. I always look for North American, South American or European Union products most come from trustworthy sources. As for lobster meat, I’ve found that readily available in most supermarkets in 8-ounce and 16-ounce packages in the frozen seafood section near the fresh fish area, and of course, the lobster of choice is Maine or Canadian. In the case of a sauce, a little goes a long way, which makes it an affordable luxury. You do want lobster meat and not lobster tails for this type of dish as the tails will get tough and chewy and are best used for broiling or grilling. 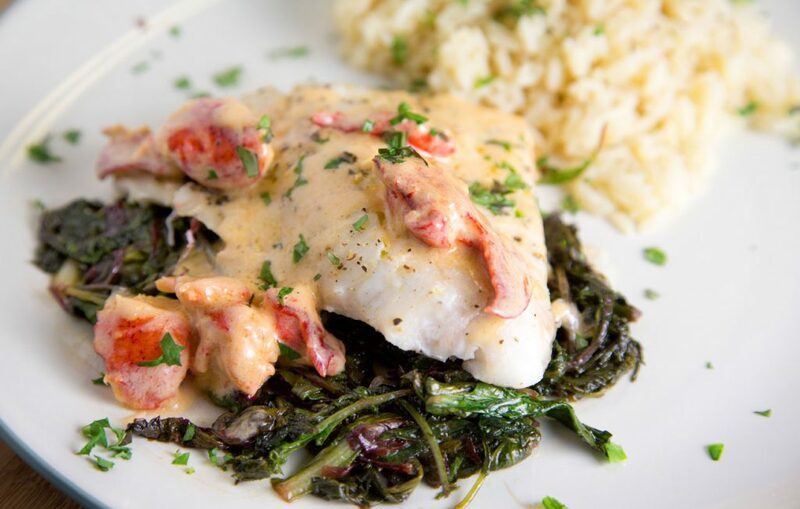 So now that you’ve read my thoughts on seafood its time to impress your guests with my Red Snapper with a Lobster Cream Sauce! Add in lobster and continue to reduce for another 5 minutes, the sauce should be reduced by about 40-50 % turn off heat and allow to rest until fish is done. Wow this looks downright incredible!! I love that lobster cream sauce – I bet it adds just the right amount of richness to the dish!! Lobster, yum! This will surely be a hit here. I bet it tastes so delicious! Oh, man! You know me, I love, love, love seafood. Never tried preparing the red snapper like this before though. I’m def going to try your recipe. Yum! I am not very familiar with seafood, and this sounds like an interesting combination, with the fish and the lobster. It’s nice to have some different recipes to try out. My mind is blown with lobster cream sauce. I am thinking it would be heavenly on top of some delicious homemade pasta. You have definitely made me want some Lobster. I’m not sure if I should take the time to cook it or just head to a seafood restaurant! Your recipe looks delicious. My son just tried lobster for the very first time last week. He loved it. I bet he would like this dish! We’ve been eating more seafood that past few months. However, we haven’t eaten Red Snapper so we will be adding it to next month’s menu. I’m picky about where my seafood comes from. I grew up eating fresh seafood. The next time I buy Red Snapper, I’m going to make this recipe. It looks so tasty and pretty! An interesting post and learning about where to get fresh seafood was so important. 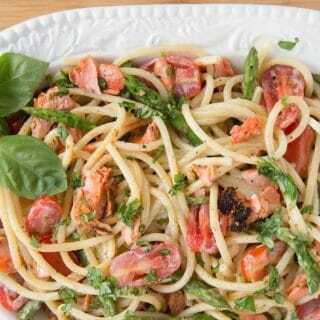 My son loves seafood so i have to learn how to make this for him. My husband would be all about this dish. He’s a huge fan of seafood. I wish I liked it, because this does look tasty. That sounds absolutely amazing. I am looking for something new and different to eat and I think this is it. It looks delicious. Today, had red snapper filleted at HEB and will serve it over asparagus. Can’t wait for this evening. Can the sauce be used on Ravoli as well? it certainly would make a delicious sauce for ravioli! It could be used on chicken and just about any type of fish as well. Here was my take on your sauce. I can never leave a recipe as is, I always tweak just a little bit. I’m a sous chef myself. I started the sauce with 8oz of white wine, burned off the alcohol, then added a pt of heavy cream while wisking, then reduced it down by about 50%. While doing that, I steamed 5 small lobster tails and ice bathed them long enough to cool the shells, peeled the shells, diced the lobster meat, then sautéed the rest of the way in avocado oil with old bay, adding 1oz of white wine to the pan about a minute after adding the lobster. I then combined the reduced cream and the lobster together, and mixed in about 2 tbspns of chopped Italian parsley, and a 2 finger pinch of fresh chopped dill. I used the sauce on filet mignon in a surf and turf with shrimp skewers. Was AMAZING. Steamed for 6 minutes **. Note: this is still partially uncooked lobster when it goes into the sautéed pan, and without bringing the temp up to fully cooked, do not eat and handle like raw food. Time is of the essence here. Do not let it sit between the steaming and the sautee. You should still be burning your fingers a little bit as you peel the shell. Thanks for your tips Mike and I’m happy to hear you enjoyed the recipe! OH YES, YES, YES…total winner. Looks good and want to give it a try but what is or in Old Bay seasoning? This sounds wonderful, I am going to try this tomorrow. Question thoughts on pan frying the snapper? Pan frying is a good option Jason, just cook the fish as you normally would and make the sauce in a separate pan. Red snapper has a unique flavor which I really like. Currently I’m in Indonesia where every kind of fish is easily available. I’m thinking to give this recipe a try probably tomorrow 🙂 Thanks for sharing, keep posting! Dude. Right now, the best price on Gulf Red Snapper in my little Texas town is $27 per pound. April was supposed to be “no spend month” at the Holland House, but this ruins it. P.S. — Thanks! The whole “no spend month” was my wife’s idea anyway! I hear you Adam, I used a frozen product no where near that cost, but Fresh Texas Snapper would be awesome! 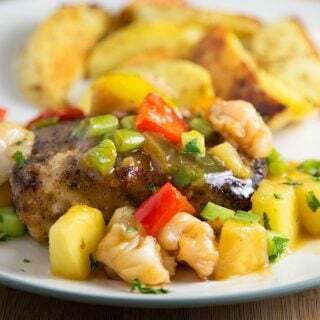 Wow this looks super good and I believe I have both lobster and snapper in the freezer. I hope you enjoy it Larry! 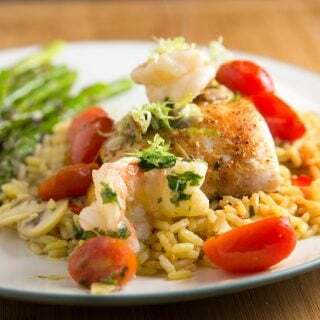 I love red snapper and am so pleased that so many grocery chains up where I live are making the effort to be more discerning with their fish and seafood selections.